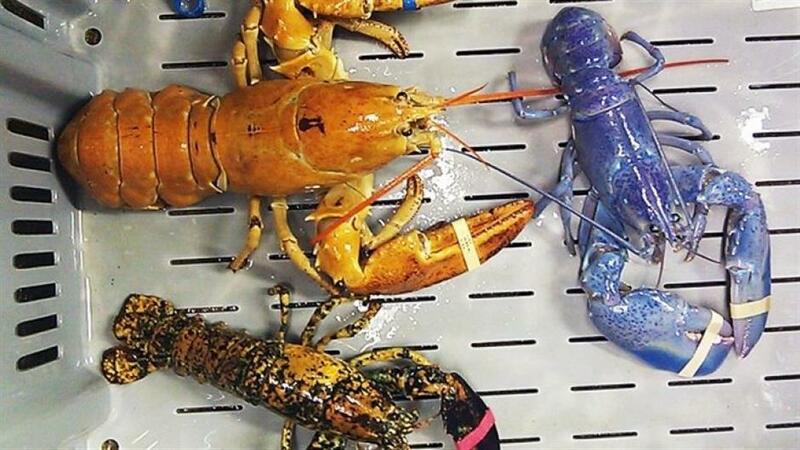 A New Hampshire lobsterman has joined an elite club after catching a rare blue lobster. A bright orange, left, a bright blue, right, and a calico lobster at New Meadows Lobster in Portland, Maine. The Portsmouth Herald reports Greg Ward initially thought he had snagged an albino lobster when he examined his catch off the coast Monday where New Hampshire borders Maine. The Rye lobsterman quickly realized his hard-shell lobster was a unique blue and cream color. The oft-cited odds of catching a blue lobster are 1 in 2 million. But no one knows for sure. Ward says the lobster is unlike anything he's ever seen. He gave the rare crustacean to the Seacoast Science Center in Rye to study and put on display. Center aquarist Rob Royer says Ward's blue lobster will go on display in the "exotic" lobster tank once it acclimates to the water.